Save dinner and your sanity by preparing these four easy meals and stashing them in your freezer for busy nights. Each one of these recipes takes as little as five minutes to prepare for the freezer—10 minutes at most! Commit less than an hour on a Sunday and you will have four main courses ready when you need them. These skillet chicken freezer meals start with the same basic concept: chicken frozen with a marinade, then cooked with a vegetable or two. But each has their own blend of spices and seasonings that make it unique and give you some variety during the week. I specifically use thinly sliced breasts because they thaw faster, cook faster, and you have more flavor with every bite. When it’s time to cook your evening meal, you only need one skillet and about 30 minutes. Hello, weeknight dinner? We found your saving grace! Label the zip-top bag. Write the date, the title of the recipe, and SimplyRecipes.com, so you can easily find the instructions months later when you want to cook the chicken. Roll down the top of the zip-top bag a little bit to avoid touching the outside of the bag with raw chicken. Add the chicken and seasonings. Seal the bag and smoosh the chicken around to ensure each piece is coated in marinade. Open the bag after smooshing the chicken, and unfold the chicken pieces so they lay flat. 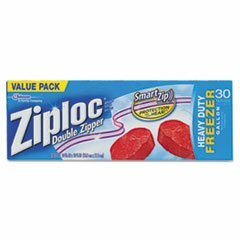 This will save precious freezer space. Remove as much air as possible and reseal the bag. Stack the bags one on top of the other and freeze! Transfer the bag of frozen chicken from the freezer to the fridge in the morning before you leave for work, and the chicken will be ready to toss in the skillet when you get home. If you realize you have evening plans at the last minute, don’t worry about it! The chicken will keep for 48 hours in the refrigerator. To quickly thaw your chicken, place the bag of frozen chicken in a bowl with hot water. It should thaw within 30 minutes. You will need to prepare fresh or frozen vegetable for these freezer meals on the day you make them. But don’t worry, it will still only take 30 minutes or less to put dinner on the table. You can also swap the veggies in the recipe for whatever veggies you have on hand. There are slight variations for each recipe, but for the most part, you will cook the chicken; add the vegetables; remove the chicken; then finish cooking the vegetables. Just before serving, you will add the chicken back to the pan. Don’t order another box of takeout! Have something quick, healthy, and delicious waiting for you at home! Spinach, red onion, tomatoes and capers make this quick and easy skillet dinner a weeknight superstar! The briny flavor of olives pairs beautifully with creamy potatoes and earthy Swiss chard. Using frozen corn, canned beans and chopped fresh peppers makes this complete meal ready in 35 minutes! Quick cooking thin sliced chicken breasts, colorful bell peppers and crisp green beans make this skillet dinner a fast and easy weeknight feast!